There were nearly 6.5 million baseball pitches thrown throughout the past nine seasons of Major League Baseball, and Carson Sievert’s PITCHf/x tool was able to capture every single one of them! Each year, thousands of fans gather at their favorite team’s stadium to revel in the excitement while witnessing the great pastime unfold in front of them. The tension between the pitcher and hitter right before the pitch is thrown is one of the subtle moments that make the game of baseball so magical to its fans. What’s coming at the batter next? A fastball? Slider? Cutter? Change-up? Only the catcher knows, but one thing is for certain – the ball is destined to cross home plate! Pitch types have been evolving for decades now, and each type has ridden its own trend wave throughout major league history. 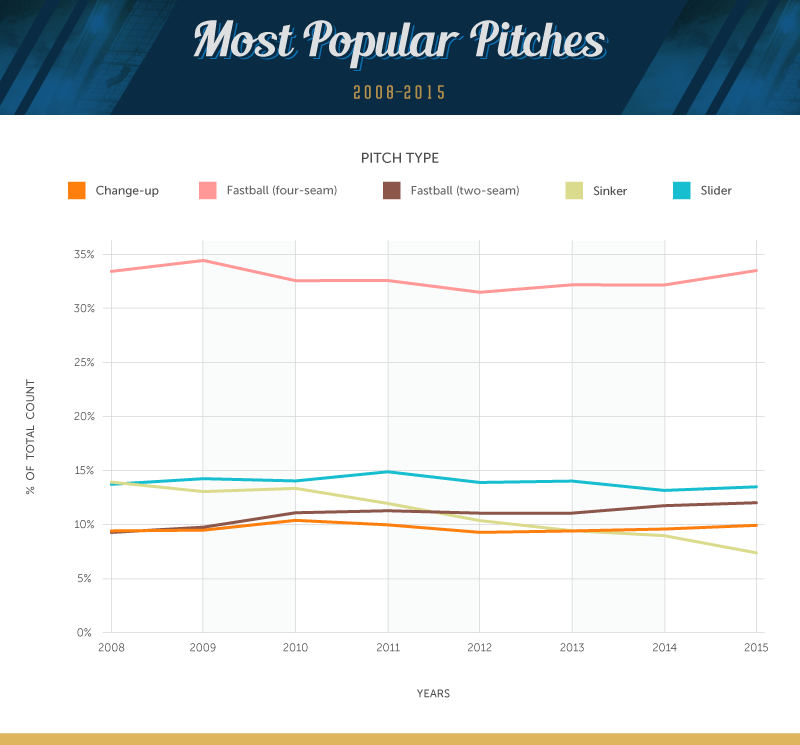 The sports buffs over at Fanatics decided to take a deeper look into this pitch data by visualizing every pitch type from the 2016 season so far as well as the stats on all pitches since 2008. Read on to explore the preferred pitch types of modern-day flamethrowers. Now, you may be asking: What can we possibly do with all of this pitching data? The answer is – a whole lot! 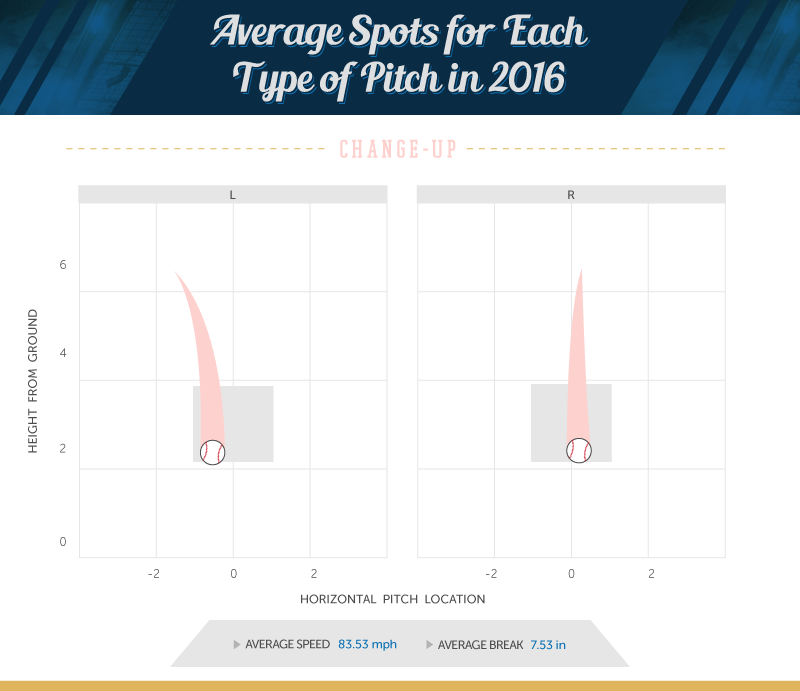 Focusing on the ongoing 2016 season, we mapped out every pitch released from the league’s flamethrowers since the start of the year. The pitch-zone charts we set up are quite simple to follow. There are two sides that indicate the stance of the batter (lefty or righty), and each pitch is identified by a different color. Just looking at colors, it’s pretty obvious that the fastball dominates the charts! Between the cutter, split-finger, two-seam, and four-seam, pitchers love to jet these pitches across home plate. If you take a closer look, you can see how some of the pitches break back across the plate. This technique is mainly seen when the pitcher throws a change-up or cutter. Change-up – For the tricksters on the field – this pitch is an attempt to fool the batter by changing the speed of the ball. Curveball – Strike three, you’re out! That’s exactly what you’ll hear once this strikeout pitch is thrown. Cutter – Perfect for jamming hitters – the ball gets nailed by the handle of the bat, inducing grounders or weak pop-ups. Split-finger – Lookin’ for a missed swing? Look no further because this pitch specializes in causing batters to miss. Forkball – A breaking pitch that causes failure in ball recognition, this one disrupts timing. Knuckleball – This pitch is out of control, making it hard to hit due to its ambiguity. Sinker – No surprise here, this pitch sinks down with the goal of forcing a grounder. Slider – Known as one of the hardest pitches to hit and throw – results vary (if your bat even manages to taste the ball). Considering how many different pitch types exist, it’s difficult to remember – let alone identify – them all. But don’t feel discouraged – even umpires and sports announcers have a tough time naming every pitch. Luckily enough, we were able to visualize the average pitch spot for the top pitches utilized by modern-day pitchers. In addition, we pulled together the following factors that will boost your pitching knowledge and assist you in identifying the next pitch soaring down the dirt strip. A pitcher typically only employs a few selections in his pitch repertoire. For instance, Yordano Ventura of the Kansas City Royals usually only throws fastballs and curveballs, with the occasional change-up or slider. Focus on the following: hand grip, ball rotation, and point of release. Take a glance at the recorded pitch speed; the velocity of a pitch is one of its defining features. Have some patience! Some consider identifying pitches an art form rather than a science. Every pitcher throws his particular pitch with whatever technique comes naturally to him. You couldn't tell Picasso to paint using only one style, so you can’t tell a pitcher to throw using an exact form! However, each pitch type typically follows the same path and can be pinpointed at an average location (see the charts above). One thing pitchers are blessed with is the ability to choose their weapon of choice once they’re on the battlefield. To the surprise of just about no one, the four-seam fastball reigns supreme as the most popular pitch over a span of nine seasons – perhaps due to the fact that it’s the easiest pitch to control! Differentiating itself from the competition, this pitch must be thrown with its seams in a horizontal position, which creates the illusion of the ball rising as it approaches the plate. Although small fluctuations do appear, this pitch comprised nearly 33 percent of the total pitch count over the years. On the other hand, pitches such as the change-up, slider, and two-seam fastball weren’t the most popular kids on the block – but they maintained a consistent percentage of the total pitch count. Some pitches just don’t get the love and attention that they used to. Unfortunately, the sinker has fallen out of popularity. Often used in the past to force the batter to slam a grounder to the infield, the sinker is seen less in modern play due to its unnatural mechanics. We have noted an over 46 percent decrease in the use of the sinker throughout the past nine seasons. Champions reigned from above during the 2008 and 2009 MLB seasons, with both winning teams hailing from the tri-state area. The Phils (Philadelphia Phillies) and America’s favorite baseball team (the New York Yankees) claimed their rings after crushing their opponents on home turf. 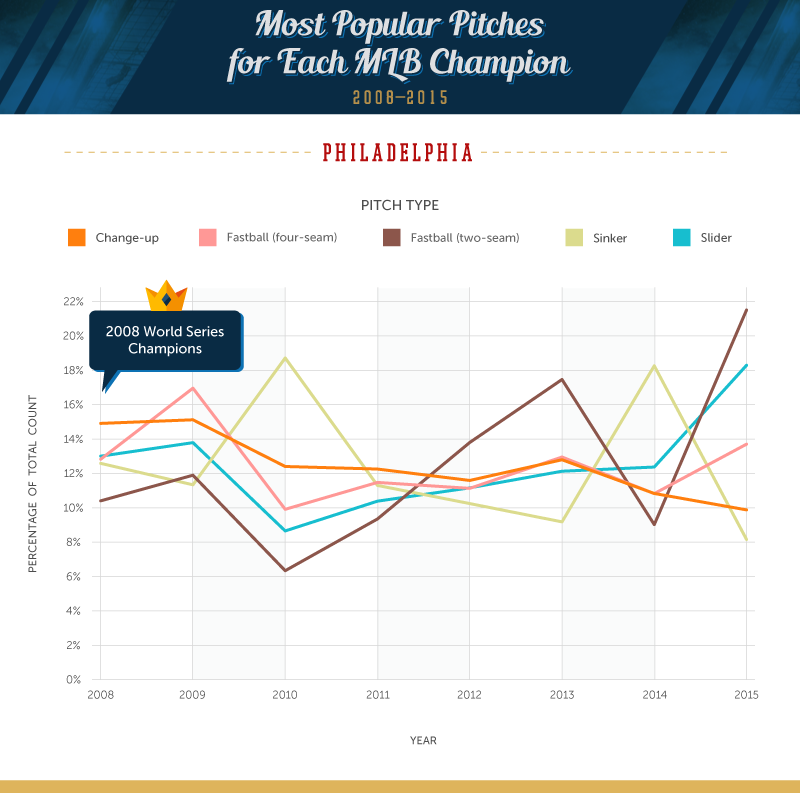 The Phillies haven’t had the best of luck during the World Series trials – they were only crowned victors twice out of the seven times they competed. Despite the lack of victories, the Phillies’ 2008 championship was one for the books! Led by starting pitchers J.C. Romero, Ryan Madson, and MVP recipient Cole Hamels, the Phillies were able to topple the Tampa Bay Rays in Game 5. Their pitch of choice? 15 percent of their total pitch count consisted of change-ups, while around 12 percent was made up of two-seam fastballs and sliders. On to the Big Apple – the New York Yankees have won more World Series titles than any other MLB team in history. In recent years, 2009 was the last time the Bronx Bombers decorated their hands with fancy rings – defeating their bat-sluggin’ neighbors (the Phillies) in a nail-biting Game 6 (Score: 3–7). Paving the path to victory, C.C. Sabathia, A.J. Burnett, and Andy Pettitte appeared in the team’s starting pitching rotation. The preferred pitch type for these clean-shaven, pinstriped-wearing men was the sinker (15%), the change-up (14.6%), and, of course, the four-seam fastball (14%). Since their inception, the San Francisco Giants have definitely made a name for themselves within Major League Baseball. Throughout the franchise's history, the Bay Bombers have made it to the World Series 20 times – emerging as champions eight times. As visualized above, these Cali-lovin’ pitchers have had different preferences in pitch type during each of their World Series conquests. In 2010, the Giants’ starting pitchers against the Texas Rangers included Tim Lincecum, Matt Cain, and Madison Bumgarner – and they were able to wrap up the series after a Game 5 victory. The Giants kept things fast in this series, with their flamethrowers consistently beaming two-seam and four-seam fastballs across the plate. They were sure to switch things up a bit, however, by pitching change-ups for 14 percent of the total pitch count. 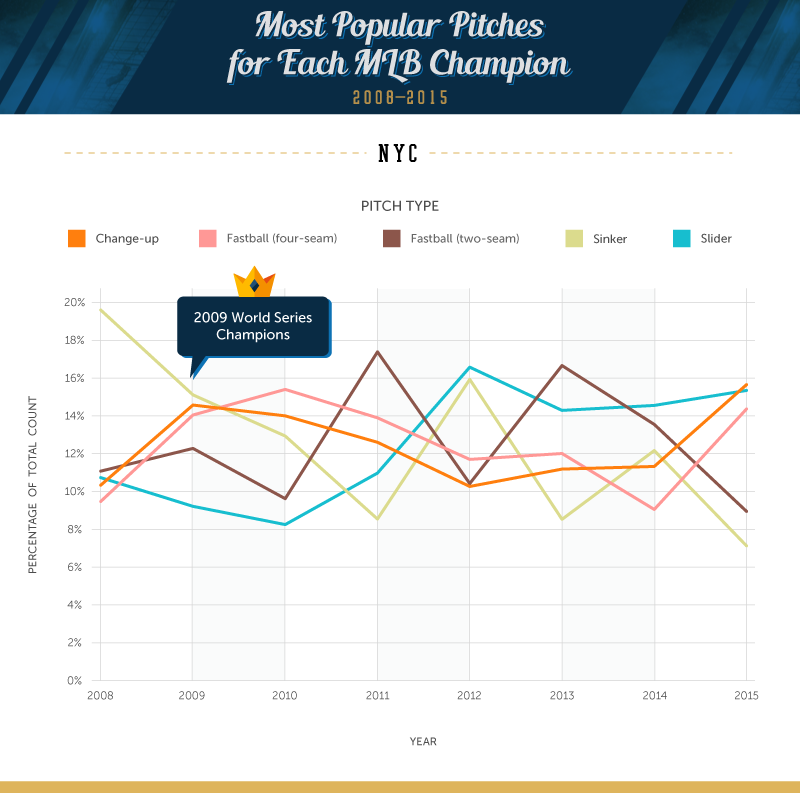 The next two World Series wins to follow – 2012 and 2014 – saw the rise and fall of pitch types not often called upon by Bay pitchers of the past. In 2012, we witnessed Jeremy Affeldt, Madison Bumgarner, and the Horse (Matt Cain) primarily utilize two pitch types: the slider and the sinker. The change worked and allowed the Giants to defeat the Detroit Tigers in Game 4. Interesting things occurred during the following two seasons – 2013 saw the sinker dwindle down to a mere 3.48 percent of the Giants’ total pitch count, while 2014 saw it rise from the ashes and soar above 16.52 percent to scorch the Giants’ opponents, the Kansas City Royals, after Bumgarner pitched five shutout innings and was crowned Series MVP. The 2011 World Series finals defied everyone’s expectations. The St. Louis Cardinals came out on top after a blowout victory in Game 7. In 2011, you would have been laughed out of town if you’d claimed the Cardinals were going to the World Series – even the team members themselves had their doubts. In a sense, the Cardinals achieved the “impossible dream” by turning a horrendous season into one of the most memorable World Series in baseball history. 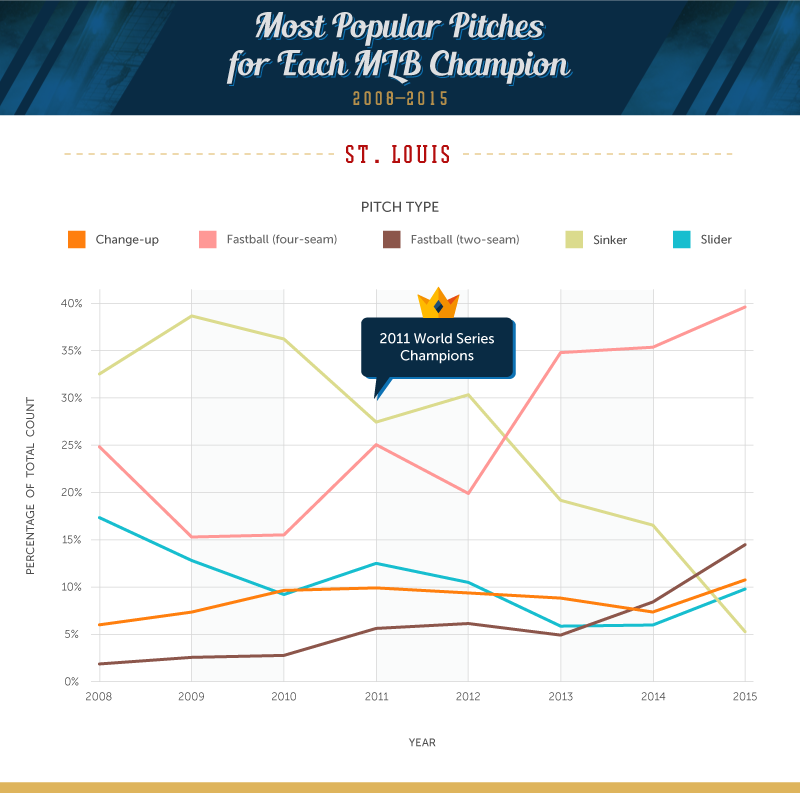 When he wasn’t beaming fastballs across home plate, seasoned Cardinal Chris Carpenter opted to throw one of the least popular pitches – the sinker. According to the data we obtained, the sinker began its decline after the 2010 season. It looks as if Carpenter was forcing the Texas batters to hit solid grounders for an easy out! In recent seasons, the World Series champions have been a product of the American League – all fingers pointing to the designated hitter rule. The designated hitter rule was adopted by the American League in 1973 and has been a staple in the organization’s gameplay since. So, you may be asking, how is this rule fair when American League teams play against National League teams? It’s quite simple – American League pitchers must step up to the plate when performing at any National League team’s stadium. 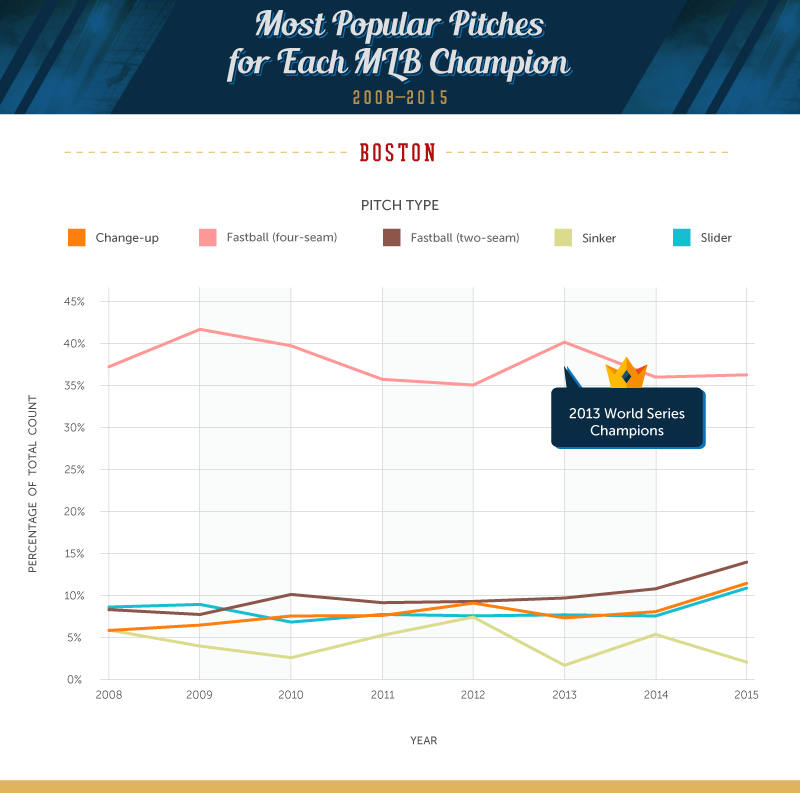 Looking at these graphs, one thing is clear: The four-seam fastball is unanimously the pitch of choice – composing over 40 percent of the Boston Red Sox’s total pitch count and nearly 37 percent of current champion Kansas City Royals’ pitch count. As recent trends show, the four-seam fastball has been a favored pitch – mostly based on the fact that it’s the most difficult pitch type to cross the plate. Nowadays, fans love witnessing a speedy pitch zip right past a hopeful batter who inevitably hears the words, “You’re out!” Our analysis shows that pitchers love throwing this pitch as much as crazed fans love seeing it. 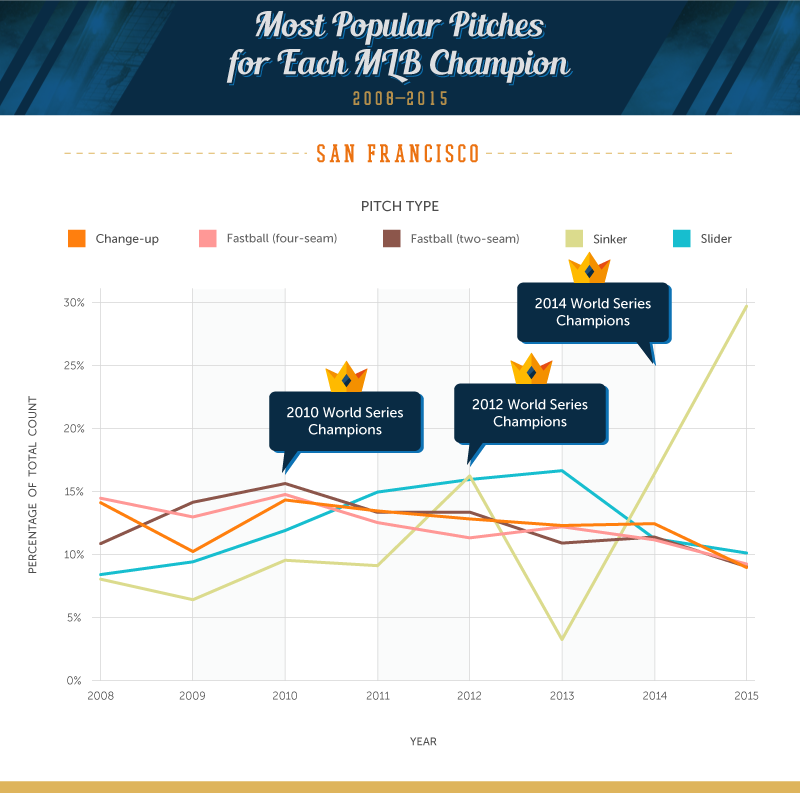 One interesting note – the 2014 World Series champions, the San Francisco Giants (National League), made use of the sinker for the majority of their pitch count, while the sinker wasn’t nearly so popular with the previous (2013) and current (2015) pitch champions. At the end of the day, the beauty of being a pitcher is having the flexibility to choose the pitch that perfectly fits your craft. Although they may have their differences, the American and National League pitchers can both agree that there’s nothing more satisfying than pitching the perfect payoff pitch – resulting in the final strikeout! Heading out to the next ball game? Now that you’re a baseball statistician, keep track of your favorite player’s pitch count while rockin’ his latest jersey! Look no further than Fanatics for all your baseball essentials. Pitch data was scraped from MLB.com using a custom written R-script (program language) for all MLB games that were played from the 2008-Current 2016 season. 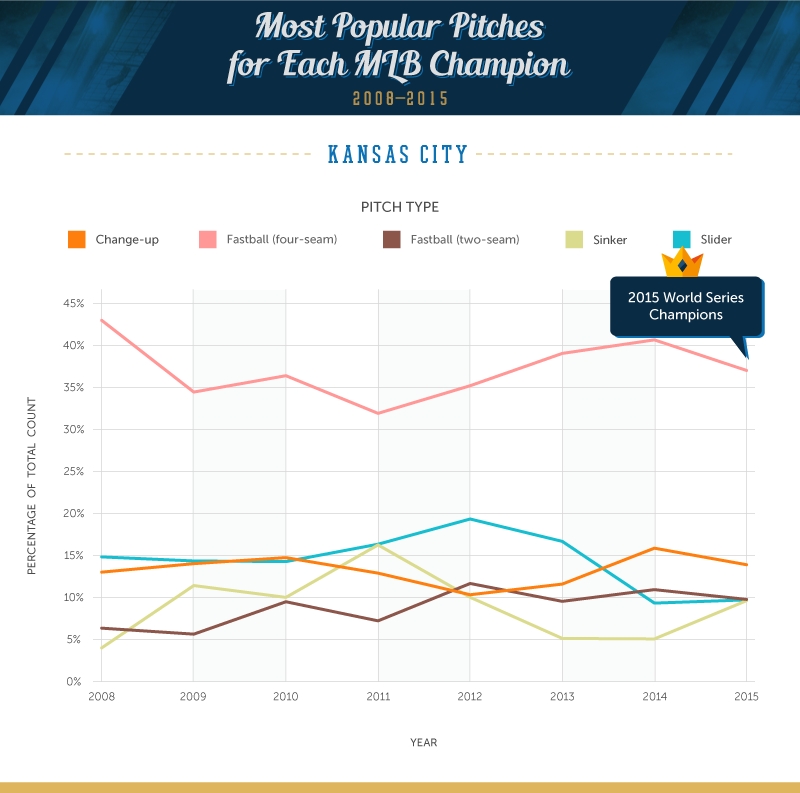 Pitch types were analyzed and ranked by the percentage they were used in each team’s – including World Series Champions – pitch counts throughout the past nine seasons.